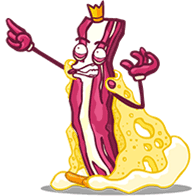 The ultimate King Bacon Boss finally appears. Use vegetables to have a big fight with him and his gang! In Veganopolis, a huge war has just begun! The mean King Bacon and his wicked sidekicks are messing up the city! Destroy’em all! But be careful not to kill the pitiful chickens rushing for safety! Enjoy this hilarious-style game and be the winner!